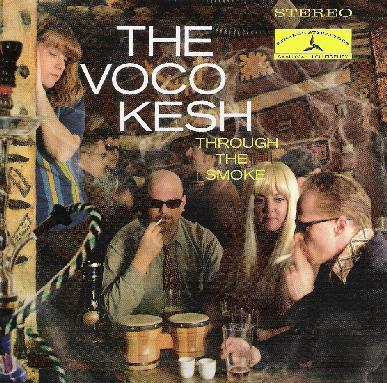 The Vocokesh - "Through the Smoke"
The offspring of legendary space rockers F/i, Vocokesh have become a legend of their own. They continue their improvised exploration of all things dark and trippy on their latest, and second release on the Strange Attractors label, Through the Smoke. Things kick off with the brooding emanation of Vibe # 6, a menacing, chugging stew of spacey sounds with scorching guitar that falls somewhere between Manuel Göttsching's early work with Ash Ra Temple and some lost metal band from the 70's. Things then kick into overdrive with the tremolo pulsing powerhouse of the Vocokesh Theme Song. This one really rocks and has some very freaky electronics burbling and pulsating through the mix. After this rousing space flight, you'll feel like you landed on a distant, alien world with the swirling, murky, semi-ambient space soup of 12 Monkeys. This sets the listener up perfectly for the first of two extended excursions into deep space, this one being the title track. From clanging bells and deep washes of late night synths and Mellotron-like sounds a thudding rhythm emerges, as dangerous, edgy guitar reminiscent of Fripp-style playing cuts through it all like a razor blade till it all dissolves into a mass of squelching electronics and free-form madness, eventually returning to a slow, spacey jam with that Frippy guitar again. Two shorter pieces follow, the "help me, I've been abducted by funky aliens" jam of New Cropcircle Boogie, and the free exploration of Nothing Implied. The final 16 ½-minutes of the album are taken up by the immense, spacious expanse of Sunday Afternoon. Slightly more structured than perhaps most of the other tracks on the album, the not so dark Sunday Afternoon nonetheless explores a softer, shimmering ambient side along with the languid, flowing rhythmic sections that open and close the piece, making for a glorious, gliding by the rings of Saturn kind of end to the album. Through the Smoke is the kind of album that gets better with every listen, as you sink deeper and deeper into its mysteries and its charms. It starts off dark, buts ends up vibrant with flickering shadow and golden light, making it the perfect listen for just about any time of day.